Partners Ryan Seelbach and Eric Lund are pleased to announce the January anticipated opening of TAKODA, a contemporary American restaurant and rooftop beer garden located at 715 Florida Avenue, NW, Washington, DC, 20001. TAKODA, a Native American name meaning “Friend to Everyone,” will offer guests comforting, creative takes on American classics with a large emphasis on local and seasonal sourcing. Chef Damian Brown's opening menu will feature sharable small plates and salads like Bacon Popcorn with parmesan and chives; Blackened Catfish Taco with lime cabbage slaw, avocado cilantro sauce, served on a corn tortilla; Soft Pretzel & Beer Cheese, served warm with beer cheese fondue; Wings, in four different styles including PB&J, parmesan garlic, Old Bay dry rub and classic spicy buffalo; Spinach Dip with grilled flatbread; Brisket Sliders, topped with cabbage, served on a mini pretzel bun; Rosemary Parmesan Tots, flash fried, tossed with rosemary and parmesan; Skillet Mac & Cheese, served with a selection of seasonal ingredients; Cranberry Kale with radish, apple, parmesan, pecans and cranberry vinaigrette; Grilled Romaine Caesar with pretzel croutons and lemon parmesan, as well as Mixed Greens with shaved fennel, carrots, red onion, mozzarella, and a lemon pepper vinaigrette. Small plates range in price from $5 to $9, and salads from $5 to $8. Opening entrée highlights include Chicken & Sweet Potato Waffle, Southern fried chicken with pecans and black pepper maple syrup; Shrimp & Grits with Tasso ham, pepper sauce, sautéed spinach and sunny side up egg; Brisket Flatbread with BBQ aioli, roasted garlic, grilled onions and fresh mozzarella; Pan-Seared Salmon Cakes with tartar sauce, roasted pepper aioli, served with a shaved fresh vegetable salad; Cheeseburger with cheddar, Thousand Island slaw, pickles and whole grain mustard, served on a pretzel bun; Veggie Burger, quinoa, lentil, chickpea, and barley burger with pimento cheese and whole grain mustard, and the TAKODA Burger with two bacon-infused patties with applewood smoked bacon, bacon & cheese fondue and a sunny side up egg, served on a pretzel bun. For a sweet finish, guests can enjoy desserts such as Molten Chocolate S'mores, milk chocolate lava cake with toasted marshmallow and graham cracker; Grandma’s Apple Pie, freshly baked accompanied by vanilla gelato; Seasonal Crème Brûlée, Chef Brown's twist on the bistro classic, and Deep Fried Oreos with vanilla icing dipping sauce. Entrées range in price from $12 to $19 and desserts are $4 to $8. Additionally, for guests seeking late night snacks after a night out on the town, TAKODA will offer a special menu featuring select items from the dinner and dessert menu including Bacon Popcorn; Wings; Spinach Dip; Rosemary Parmesan Tots; Soft Pretzel & Beer Cheese; Seasonal Crème Brûlée, and the Deep Fried Oreos. The late night menu is available Friday and Saturday from 11 PM to 1 AM. A native of Capitol Heights, Maryland, Damian Brown earned a culinary degree from the Lincoln Culinary Institute in Columbia, Maryland in 2010. Brown began his career serving as a baker at Zola Wine & Kitchen, a private event and test kitchen concept from the owners of the now shuttered Zola restaurant. Then in August 2010, he began working as lead cook of 8407 Kitchen + Bar in Silver Spring, Maryland. Interested in exploring other cuisine styles, he accepted a position as sous chef/tournant at Vidalia in Washington, DC in July 2011. Here, Brown learned how to manage the various kitchen stations while working under James Beard award-winning Chef Jeffrey Buben. Then in July 2013, he accepting a position as junior sous chef of the Occidental Grill & Seafood, before being tapped as lead prep cook at the acclaimed Blue Duck Tavern in August 2013. Brown was next offered a position as chef de cuisine of Stanton & Greene, which is known for its modern American cuisine and retro bar bites. He served at this Capitol Hill restaurant from October 2014 until July 2015, when he was tapped by Seelbach and Lund to open TAKODA. For the perfect pairing, TAKODA offers 24+ American draft beers including local favorites such as DC Brau, perennial favorites such as Bell's Brewery, Inc., and a variety of seasonal options. Beer prices range from $6 to $10. The restaurant will also have an extensive whiskey collection of 50+ American spirits including Bulleit Bourbon, Knob Creek Bourbon Whiskey, Buffalo Trace Distillery, Copper Fox Distillery, Jefferson's Reserve Bourbon, as well as monthly rare acquisitions. Prices for whiskies range from $7 to $35. TAKODA’s main dining room is located on the second floor. It offers guests an expansive, inviting space for socializing with seating for 40 people, as well as an additional 20 seats at the bar. The 4,600-square-foot restaurant also features a year-round rooftop beer garden, which overlooks Florida Avenue. Here one will find a canopy with an expansive skylight situated over an island bar and operable windows allowing for year-round eating and drinking in a light-filled venue. Both rooms will be available for full or partial buyouts, and can accommodate up to 120-seated guests, or 240 for a standing reception. Off-site catering will also be available; interested parties are encouraged to contact General Manager Sean MacDonald at sean@takodadc.com. 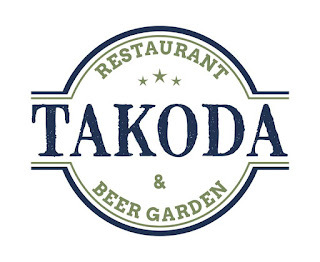 TAKODA Restaurant & Beer Garden is located at 715 Florida Avenue, NW, Washington, DC, 20001. The restaurant is located two blocks from the Shaw-Howard Metro Station accessible on the Green and Yellow lines. Dinner is served nightly, from 5 PM to 11 PM. The bar is open Monday through Thursday, from 5 PM to 12 AM; Friday, from 5 PM to 3 AM; Saturday, from 12 PM to 3 AM; Sunday, from 12 PM to 11 PM. A late night menu is served Friday and Saturday, from 11 PM to 1 AM. Brunch will begin at a later date, and will be served Saturday and Sunday, from 11 AM to 5 PM. For additional information or employment opportunities, please visit http://www.takodadc.com.